The wiring consisted of wooden planks with two parallel grooves that took a bare copper wire and this was covered with a corresponding piece of wood. This supplied power for 'Swan' lamps and an electrically powered 'Orchestra' organ which was controlled by a punched paper roll and situated in the Billiard Room. Known as an Orchestrion, it was the pride and joy of Nicolini. 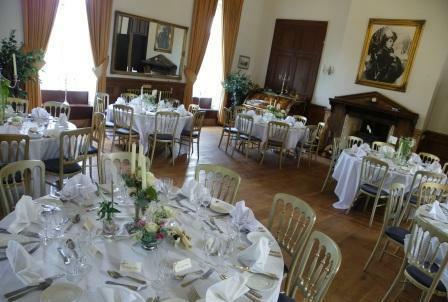 Grand pianos were also installed in most of the rooms, including the Grand Bedroom. 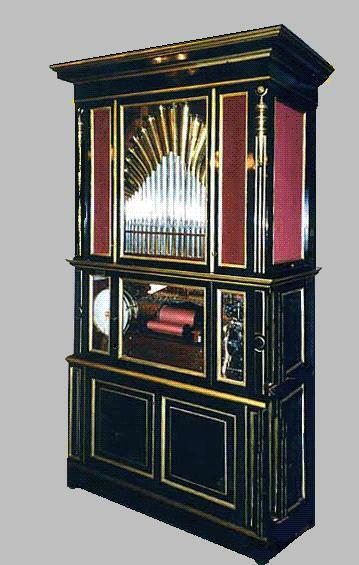 The Orchestrion was a forerunner of the "juke box" and the earliest models were controlled by a rotating barrel with pins strategically placed to initiate the notes. Punched paper rolls later replaced the pin system. These were easier to produce and allowed more sophisticated musical arrangements. 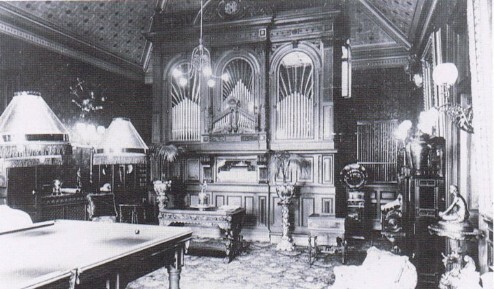 The M. Welte & Sohne Orchestrion installed in the French Billiard Room at Craig-y-Nos Castle, being one of the first to have electrical power, was probably made between 1892 and 1896. It had around 146 pipes, including up to eighteen trumpets and thirty three metal pipes, decorated with stylised gilt flowers. A blower provided the air to sound the pipes. A mechanically operated base drum, snare drum, cymbal and triangle were mounted in the back of the cabinet. "Swell shutters" in each side door of the oak panelled cabinet opened and closed to control the volume. Everything was driven by a 110 volt DC electric motor. Earlier models had used a falling weight to drive the mechanism. Orchestrions of the time were often enclosed in cabinets which matched the decor of the room The front of the cabinet had glass doors, which gave access to the pipes, the motor and the roll drive. The complete cabinet was around 107 inches (272 cm) high (a little under nine feet tall), 67 inches (170 cm) wide (over fourteen feet wide), and 39 inches (99 cm) deep. The paper music rolls were stored in printed tinplate canisters, all housed in a matching chest. The basic sound was similar to a pipe organ, but supplemented with additional instrumental sounds including drums and cymbals. 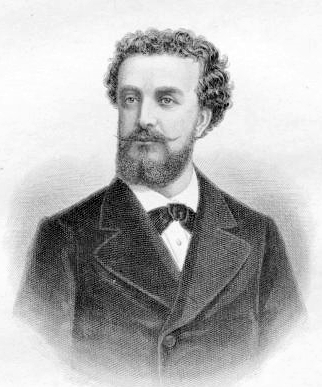 'The magnificent Orchestrion installed in the castle of Adelina Patti-Nicolini must have been one of Welte's most proud accomplishments for it was featured in many Welte advertisements. 'During a visit to England in 1963 we obtained a "lead" on the Patti orchestrion. A correspondent stated that it had been moved from Craig-y-Nos Castle shortly before 1920 and had been relocated at a summer camp near Douglas on the Isle of Man. Our hopes were high as we envisioned finding the orchestrion, shipping it to America and then setting it up to play once again! "I have tuned the pianos at the holiday camp for over thirty years and am sorry to say that the orchestrion in question is no longer in existence. It met with a series of accidents. First it was flooded. Then it caught fire because of the lighting system. The cost of repairing it was too much. After many meetings the directors of the camp had it broken up. The whole orchestrion was burned in the boiler house furnace shortly after World War 2."